MARK HALL-PATTON will moderate the September 20th panel discussion. Hall-Patton is the Museums Administrator for the Clark County museum system, where he oversees the Clark County Museum, the Howard W. Cannon Aviation Museum, and the Searchlight History Museum. He has been with Clark County for twenty years, and was previously the Director of the San Luis Obispo County Historical Museum in California. He has worked for both public and private non-profit museums, and has consulted with numerous start-up and established museums and museum boards. Mark Hall-Patton is the much-valued advisor of the Henderson Historical Society. NORMAN CRAFT grew up in Henderson, attended Basic H. S., lettered in football, basketball and baseball all four years. He was recruited by major college football programs and played college football in the Big Ten at Indiana University. Craft returned to Southern Nevada and began his education career teaching and coaching at Rancho High School. He later worked alongside Henderson coaching legend Robert Lunt in the CCSD’s Sports and Special Activities Department where he helped plan and supervise sports and extra curricular activities district-wide. In addition to his service to the Clark County School District, Craft is also a former athletic director at Bishop Gorman High School in Las Vegas, Nevada. JUDY CAMERON taught and coached at Basic H. S. in the 1960s. In the 1970s she worked with Lunt and Craft developing a plan to expand opportunities for young women athletes to compete in the junior and senior high schools of Clark County, a plan that eventually gave many of these young women the same opportunities to earn athletic scholarships that young men have. Ms. Cameron is a past principal at Bonanza High School in Las Vegas where she was honored for her commitment to athletics in education as the namesake of the school football stadium. SCOTT BAKER is a graduate of the Basic High School class of 1988 where he starred in baseball, pitching for the 1987 State Champions. He played professionally for a time and then returned to Southern Nevada to continue his sports career as a high school coach. Mr. Baker is the current head baseball coach at the newly renamed Basic Academy of International Studies. His teams in 2016 and 2017 won the State Championship. In the off-season Baker coaches an American Legion team that includes members of his high school team and players from other schools in Southern Nevada. That Legion team won The American Legion World Series this summer. 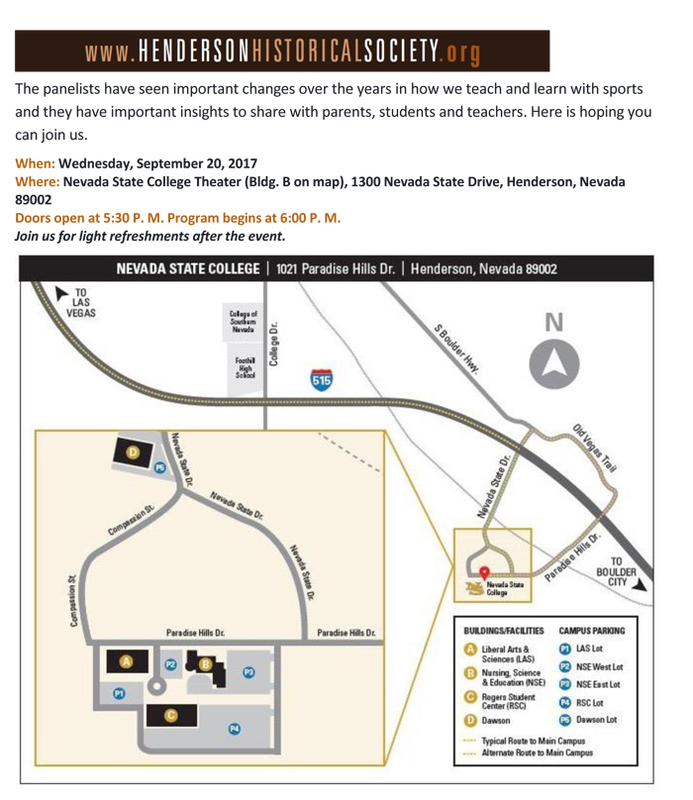 Scott Baker’s observations about his athletic experiences in Henderson and how they compare with those of earlier generations will make for an interesting conclusion to Henderson Speaks on September 20th.